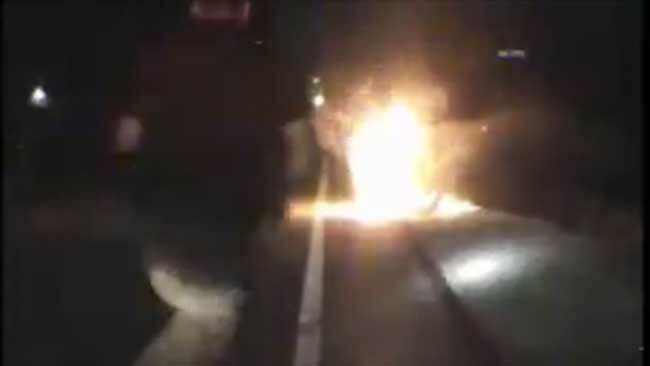 BROWN COUNTY, Wis. - A Wisconsin deputy saved a man by pulling him from a burning car in a scene that was captured on video. The incident took place at around 2 a.m. Wednesday in Brown County. Authorities say the man in the car was dazed and refused to get out. A witness at the scene observed the man in the vehicle attempting to drive the car out a ditch while it was on fire, police say. Brown County Deputy Zach Roush was the first officer on scene and approached the vehicle without hesitation, opened the door and found a motionless man in the vehicle, according to authorities. Police say the man refused to get out of the car, so Roush grabbed the man by the belt and pulled him from the vehicle -- ultimately saving the man's life. The rescue was captured on Roush's dash cam and was posted to the Brown County Sheriff's Office Facebook page along with a message touting Roush's actions. "High winds caused the flames and smoke to move in dangerous and unpredictable ways making the mere approach to the vehicle extremely dangerous. There is no doubt that without Deputy Roush's quick action, this accident would have been a fatality," the post said. The man who was in the vehicle was transported to a hospital for treatment. He was later booked into jail on suspicion of operating a vehicle while intoxicated - his third offense, authorities say.